If MC Escher's drawings were dismantled and versified, they would perhaps look something like the organic, engimatic poesie of Felino Soriano. 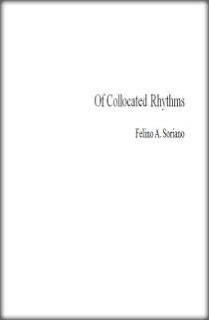 Or perhaps Soriano's poems resemble the avant-garde abstractions rife in the convoluted jazz compositions that he is so obsessively fond of. Either way, the poems in this collection, Of Collocated Rythms, boldly mirror the intricate unorthodoxies of progressive musical art. Fittingly, these poems are directly inspired by jazz. While Soriano's poetic structures replicate the stuttery rhythms of modern jazz, or even the labyrinthian visuals of, say, an Escher drawing, his phrasing mimics the musician's aural ideal. It's as though Soriano has climbed inside the pyshce of the musician to extract his or her concepts and transmute them into verse form. Felino is intutively aligned with the musical compositions that inspire his verse. The poems in this collection are both dense with symbolism and yet stripped bare of any real implict meanings. This is a paradox Soriano seems not only content to inhabit, but intent on inhabiting. He wants us to confront the art directly and subconsciously both. For him, the subconscious is the entrance to the conscious. In mining subconscious symbology, he is inverting it, and making it explicit and accessible. To successfully read a poem by Soriano, you must skim it first, so as not to be too overwhelmed by the sensations it produces. Then you must give it a more thorough reading after assimilating his quirky vernacular. And then you must read it several more times to understand his process. Because if you understand his process, then you will understand the poems. The poems, however, have a dizzying cumulative effect, and if you digest them all in one sitting, you will likely be afflicted with a severe case of vertigo. Better to read a few, put the book down, and return later to read more. Otherwise the experience is like twisting through never-ending intertwining tunnels. Of course, the subversive beauty of a Soriano poem lies in its disorienting effect. ascertaining an hour's unrequited misery. But no matter how disoriented we are, we realize that the discombulation actually brings us closer to our ideal state of being. Reading a poem from this collection is like living inside a (naturally disordered) musical composition or painting. Soriano is clearly uninterested in promoting any current trends in poetry and instead desires to forge his own poetic paradigm. Language for him evolves authentically or not at all. He is not interested in reason and logic as they are commonly apprehended; he is only interested in reinventing the experience of language, or, rather, bringing us back to its primitive core.